These bags are used with the Oreck XL2000 and are Hypo Allergenic. 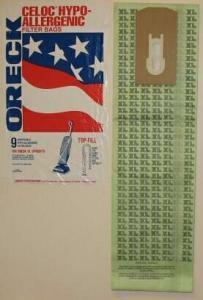 These bags can also be used with most Oreck Upright vacuums that do not have a docking system. The discounted product is offered in packs of 9 and also available in larger quantities by the case. 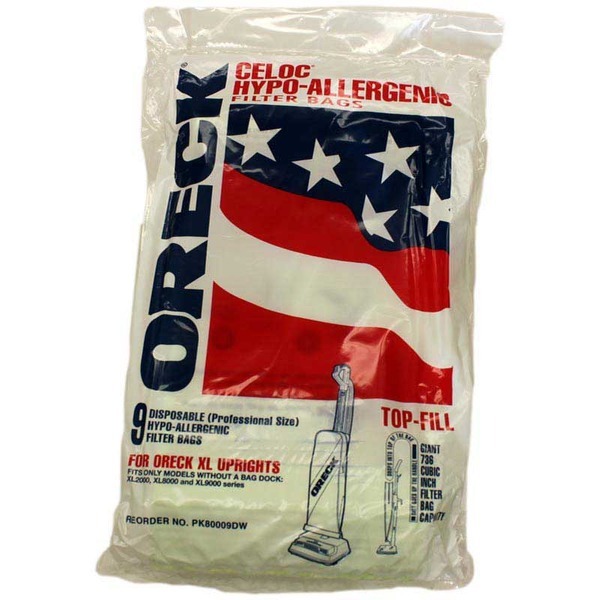 !Oreck 3 Layer vacuum cleaner bags, 630 inch cubic capacity Celoc Hypo-Allergenic bags. With Saniseal Automatic closing dust seal to keep dust in the bag, treated with Germastat to inhibit growth of germs, bacteria, mold and mildew on the paper. Fits most uprights, including Models 100C, 9100C, 888,888G, 5000, 5300, 8300G, 9200, 9400, 988, 988G, 9300, 9300G, 9800, 2000, 2100, 2200, 2300, 2400, 2500, 2600, 2700 and 2800. Bag will fit on new bag dock or old style machines.